Sharon Watts is sent to Knightstair Boarding School when her father gets an oil job in UAE. She is not thrilled at the idea of boarding school, and as the story unfolds she will be even less so. There is no school bus to meet her at the station as arranged, and the station master says the school never has a telephone. So she walks there and finds it is a Transylvanian-style castle, which strikes her as creepy. The place is deserted except for angry dogs, which look as if they were from hell or something, and are kept securely behind a section of the castle that is out of bounds. The dogs, she later learns, are called Belial, Baal and Mordred, which the headmistress Miss Nocturne keeps under control with a whip. Miss Nocturne tells Sharon that obedience is the first thing the girls must learn here, and the dogs too. Miss Nocturne confiscates Sharon’s mirrors, saying she will not need them, and says she was not met at the station because she arrived too early for them. Then she asks Sharon if she is anaemic. After an answer in the negative, she hands Sharon over to head girl, Rowena Marre. Sharon soon learns the pupils sleep by day and have classes at night, and they are forbidden to look out the windows while having their lessons: “At this school, girls only see what they are told to see!” (In case they see something they shouldn’t, perhaps?) Sharon finds it hard to stay awake in this ‘night school’. She falls asleep, has horrible nightmares of Miss Nocturne being a vampire, and is sent to bed. She wakes up at midday and goes looking for food, but there isn’t much of it in the kitchen. Exploring the grounds, Sharon finds the gates are always locked. Then she spots a gravestone with the name Rowena Marre on it, and the girl died in 1895. Sharon assumes the current Rowena must be a descendant. Then Sharon meets the caretaker’s daughter Fiona, who tells her Miss Nocturne only lets him come at night. After playing ball with Sharon she mysteriously disappears. Later, Sharon follows Miss Nocturne to an old chapel, but all she finds are bats. The bats fly away and Miss Nocturne appears on the roof. Furious at how Sharon has disobeyed her by exploring the grounds instead of resting during the day, she orders Sharon to scrub the kitchen to teach her obedience and posts a guard dog over her. Despite this bizarre form of discipline, Sharon thinks Miss Nocturne seems perfectly reasonable, even if she seems a bit eccentric “…but sort of creepy, too!” By now, Sharon should be getting hints of what sort of creepiness. Her subconscious sure is, with those nightmares of hers. Another girl, Yvonne, smuggles Sharon food to cheer her up. Sharon sneaks out of the kitchen. She is astonished to see Miss Nocturne go off in an old-fashioned carriage, and even more astonished to see it has no driver. Rowena catches her with an oddly strong grip and cold hands. She tells Sharon the place may be haunted by vengeful spirits and takes her to the vault where the dogs are kept, but aren’t there this time. Rowena tells Sharon this section is out of bounds because it is a family vault. On the staircase a knight defended the lord of the castle, hence its name of Knightstair. Sharon thinks, “nightmare’s more like it!” (Now we know where the story title comes from.) At the bottom of the steps are coffins, and Sharon sees the name “Rowena Marre” on one of them. Her nerve snaps and she runs back up the stairs. Then Rowena takes Sharon to dinner, and Sharon is surprised that they eat off gold plates. Yvonne tells her the staff and prefects eat elsewhere and sometimes pupils are “sent for” to join them. When that happens, the pupils never see them again, but it is regarded as a high honour. Miss Nocturne then enters with a list of names of pupils who have been “sent for”. At this, Sharon finally decides something is definitely wrong at this school and writes a letter to her father, but it is intercepted and taken to Miss Nocturne. Privately, Miss Nocturne realises Sharon is a threat to her. But when Sharon confronts her with her suspicions, Miss Nocturne blames Sharon’s troubles and suspicions on anaemia and should have paid more attention to the biology lessons on blood (what?). She then makes Sharon drink a tonic. Sharon feels like she is falling and sees Miss Nocturne turn into a bat. She then sees the coffins again – and one has her own name on it! Miss Nocturne appears with fangs, tells her they are the Undead and Sharon must join them by way of blood. Sharon wakes to find herself locked in a dungeon and gets Fiona to take a note to her father to help her escape, but it is Miss Nocturne who comes to let her out. Sharon wonders if Miss Nocturne is just eccentric and not a vampire. But then she hears Yvonne has been “sent for” and resolves to find out what happened to her. She also hears Miss Nocturne say that her potion is working and she will be one of them soon. While looking for Yvonne Sharon finds Fiona, who teaches her how to operate the castle portcullis (sounds like something that will come in handy when the time is right in the plot). Sharon then meets Yvonne, who is acting as if she has been hypnotised and has super-strength. Fiona tells Sharon she has become a “watcher”, the girls who guard the place in daylight. Sharon realises Yvonne has been dispatched to “watch” her. Sharon gives Fiona another desperate letter for her dad to post. In the meantime she is stuck with this “watcher” Yvonne. While at the river Sharon sees Miss Nocturne has no reflection, and finally decides she really is a vampire. As she is finally outside the school grounds she tries to escape, but the dogs chase her. She takes refuge at Fiona’s cottage, and the caretaker tells her that the school used to be a real one. Then Miss Nocturne came and turned all the staff and prefects into vampires, and drugged the pupils into submission. Sharon is the first to break free of the school. But the caretaker sees no hope of destroying its evil, as the whole place is a vampire nest now. Besides, he says, can Sharon drive a stake through a vampire’s heart? He says he is forced to work for Miss Nocturne as she killed his wife and is threatening his daughter. So he just turns Sharon over to Miss Nocturne. Miss Nocturne now reveals she really is a vampire. She shows her fangs and tries to give Sharon the bite, but gets distracted by the dogs fighting. Then the dogs just fall down dead and Miss Nocturne discovers that Fiona has poisoned them. The caretaker, Fiona and Sharon make a dash for it in a waiting car. The caretaker takes them to a warehouse where the “sent for” girls are being held. The vampires keep them hypnotised and drugged into suspended animation, and dangling from the ceiling in vampire-made membranous sacs. They serve as a food larder for the vampires and their blood is drunk as needed. However, the caretaker says he has an antidote for the girls. Miss Nocturne chases them, but gets pierced by the falling portcullis (oh, so that’s what its purpose was in the plot). Then daylight destroys her altogether. As it is daytime the other vampires will be sleeping, so the caretaker brings their coffins out to expose them to daylight and destroy them too. 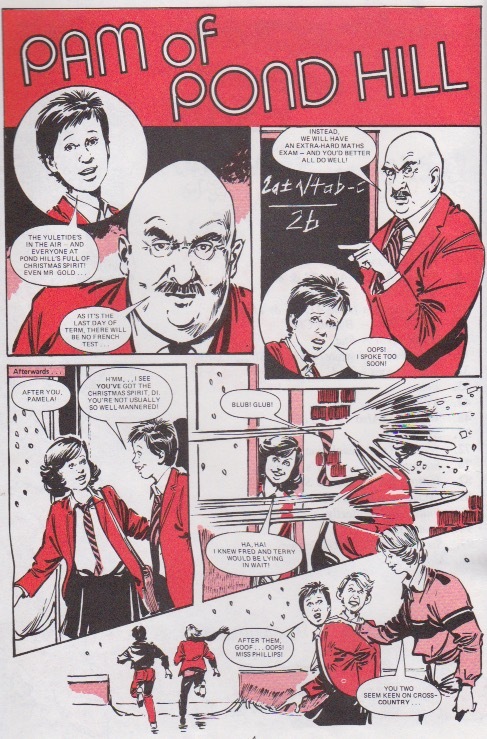 The caretaker will use his antidote to help Yvonne and the other pupils to recover, and they have no memory of what happened. The caretaker, being the school doctor as well, puts out the story that it was an epidemic that killed the headmistress and closed the school, and orders the pupils to rest for one term. Sharon is sent back to her parents, much to her great relief. Misty was one girls’ comic that was huge on vampires whereas most other girls’ titles barely even mentioned them. As far as I know, Jinty was the only other girls’ title to have serials that touched on the vampire theme: Dracula’s Daughter and Worlds Apart. 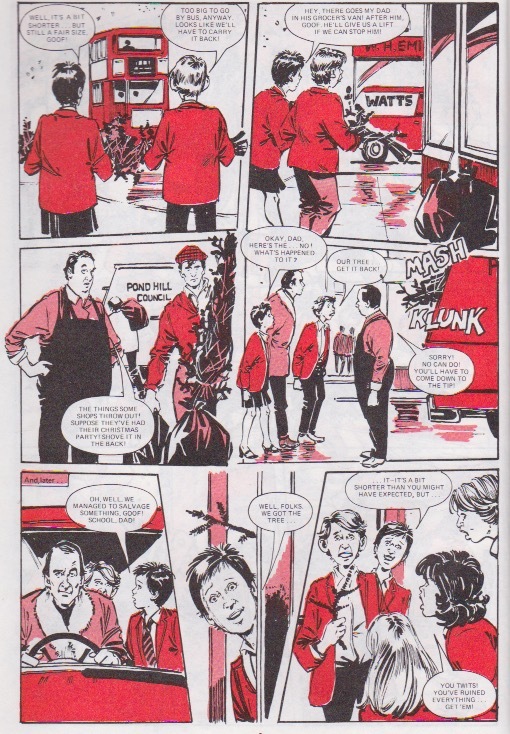 In Misty, vampires often cropped up in Misty’s complete stories. Dracula himself appeared up in a number of them, and in one case even met Jack the Ripper! But this is the only time Misty used vampires in a serial. There might have been more if Misty had run longer. Who knows? 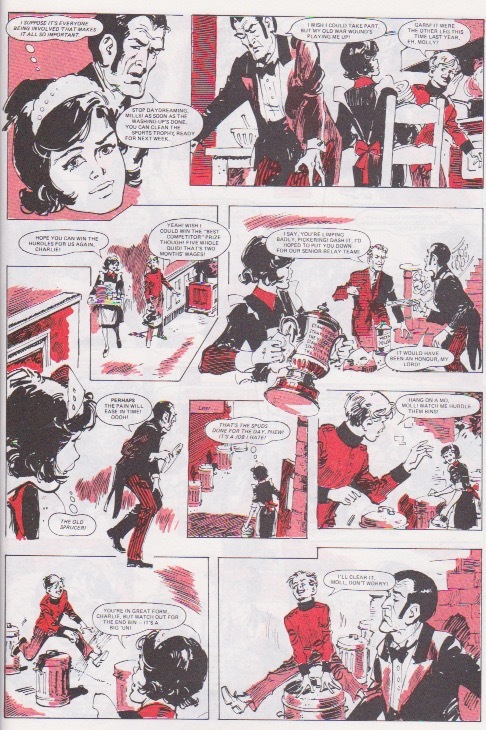 The vampire story is combined with another common theme in girls’ comics: the evil headmistress. Some of these headmistresses are just sadists who turn discipline into downright child abuse. Others, like Miss Nocturne, are using the school and its pupils for sinister purposes. But the purpose itself is a mystery that the protagonist must unravel in order to put everything right and free her fellow pupils. When we first meet Miss Nocturne we can guess she’s a vampire from the moment she confiscates Sharon’s mirror, though Sharon herself thinks (and maybe hopes) Miss Nocturne is probably just a weirdo. But the vampire herself has an unusual appearance as vampires go. Female vampires are usually depicted as looking like Vampirella, but this vampire has blond hair instead of dark. And it’s a surprise to see this vampire in a teacher’s gown and modern clothing. Little by little though, she appears in more gothic style clothing and a cloak, before finally donning an occult-style gown that has skulls on the neckline by the time she fully reveals herself as a vampire. Whether vampire or weirdo, you definitely don’t want to stay in Miss Nocturne’s school once you see her ideas of discipline (whips and total obedience? ), teaching pupils at night, and the things she likes to teach, especially in biology. None of the pupils seem to complain, or show any concern or fear at how the girls who are “sent for” are never seen again. Sharon, like all protagonists in a “strange school” serial, is the only one to sense anything wrong, be immune to or rebel against its influence, and be determined to fight against whatever’s wrong. As with other protagonists like her she gets help along the way, but they don’t or can’t tell her fully what’s going on. The caretaker and his daughter do know what it is, but they haven’t got the courage to fully help the protagonist until the final episode. And wouldn’t you know it – they have everything that’s needed to destroy it, including antidotes for the drugged girls. They just couldn’t find the nerve until Sharon came along. And even then the caretaker took a little while to come around. Fortunately his daughter Fiona showed more pluck (poisoning the dogs), which finally prompted him into action. In the meantime, we have a story that is drenched in chilling, gothic atmosphere, all rendered by the brilliant artwork of Jaume Raumeu. From the moment we first see Knightstair Castle on the hill against the night sky we get the shudders at the sight of this castle. It looks like it came straight out of Transylvania and Dracula would feel right at home there. And when we meet those guard dogs and hear what their names are, we sense the castle must be a place out of hell itself. Other things keep coming to chill and scare: the cobweb-laden coffins in the vault; the old-fashioned coach that has no driver; Sharon’s nightmares of Miss Nocturne as a vampire; Miss Nocturne punishing Sharon with a breakneck ride in the coach; the “sent for” girls who just disappear, and it doesn’t take a genius to guess what Miss Nocturne is doing with them; the hypnotised girls who serve as “watchers”…the list goes on and on. The only plot point that doesn’t quite fit is the headstone declaring the death of Rowena Marre in 1895 and the Rowena Marre we see. This is never explained and the story implies Miss Nocturne took over the school more recently than 1895 because the caretaker can recall when it was a normal school. Perhaps the Rowena Marre who died in 1895 really is a descendant of the current Rowena Marre after all. 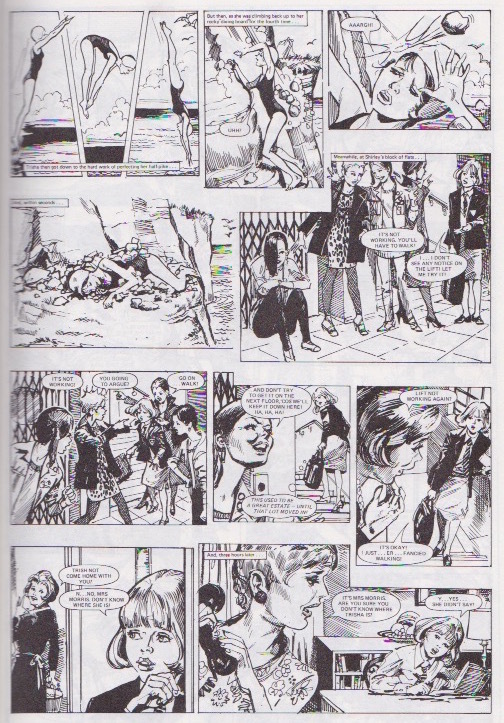 The panels that reveal the fate of the “sent for” girls must be one of the most perturbing Misty ever produced. When we see those girls trapped in those sacs and hanging from the ceiling like prey waiting for a spider to devour them, it is so macabre and sickening. We heave a sigh of relief to hear it is reversible and glad the girls will not remember it. But it does not make up for the horror of their plight. A number of evil headmistresses/teachers actually believe, in a perverse or misguided way, that what they are doing is for the pupils’ own benefit, whether it is harsh discipline, perfection induced by drugs, hypnotically induced dancing, or anything else. Curiously, Miss Nocturne’s may actually be one of them, what with her ideas of obedience and telling Sharon “one day you will thank me for it” when she has her scrubbing the kitchen to “learn obedience the hard way”. Is it all just about turning the pupils into mindless puppets and blood banks to keep her supplied with blood and minions? Or does she genuinely believe that what she is doing is for the pupils’ own benefit as well? Using a portcullis is a pretty unorthodox way to bring down a vampire. Is it supposed to be some mechanised version of the stake or something? Still, as the caretaker said, could Sharon have seriously been able to drive a stake into a vampire’s heart? After all, she would hardly have the arm for it. Come to think of it, stakes were never used to destroy vampires in Misty. Such things were not appropriate for girls to do be seen doing, after all. It’s more in the line of Van Helsing. More often Misty used the light of day to destroy vampires, as in Miss Nocturne’s case, or in one case, a silver bullet. Monster Tales was a very unconventional feature that started during the Tammy & Jinty merger. As the name suggests, it was a series where a monster of some sort was central to the tale. The monsters included gargoyles, sea monsters, man-eating plants, possessed objects or elements, dolls, demons, werewolves, freaks, and even the innocuous proving it could be monstrous. Some of the monsters were just plain evil e.g. “Hearts of Oak”, and the forces of good did not always win against them. Others, such as “The Gargoyle” (below), were used for comeuppance purposes and punishing/reforming unpleasant characters (bullying, stealing, nosiness etc) in the spirit of Misty. Some were even friendly monsters, or at least not as bad as originally thought, that saved the day. One example of this was “The Fire Monsters”, (below) which turned the cruel punishment of burning at the stake right around. Another was “Curse of the Werewolf”, where girls are left wondering if a feared werewolf from the Middle Ages was all that bad after vandals get captured in a manner that nobody can explain – except that the werewolf lent a hand. Being a monster was also used as a punishment. For example, in “The Devil’s Mark”, a man is transformed into a demon dog as a punishment for his cruelty to dogs. The curse could only be lifted by making up for his cruelty, which he does by getting help for the dogs he neglected. Monster Tales worked in rotation with the Strange Stories, which now alternated between the Storyteller and Gypsy Rose. In fact, at least two of the Monster Tales (“Stones of Light” and “The Fool on the Hill”) were recycled Strange Stories, so other recycled Strange Stories must have made their way into the Monster Tales too. As neither Tammy nor Jinty were likely to have conceived such an idea, I wonder if it was a carryover from Misty, which had merged with Tammy earlier. 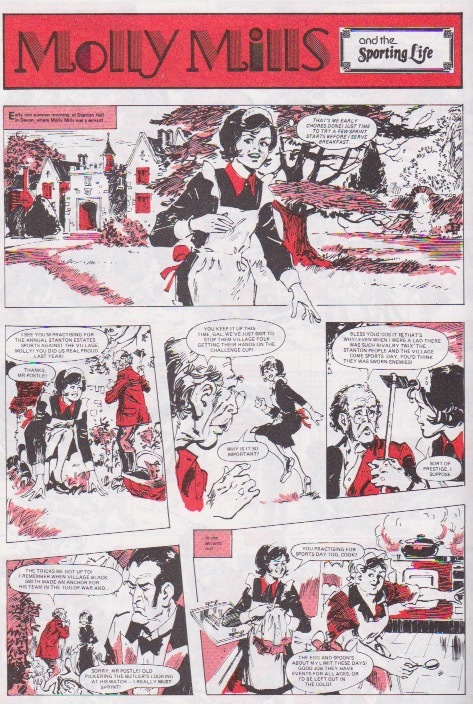 Perhaps Monster Tales was originally drafted for Misty, but no room emerged in the merger until Wee Sue, Molly and Bessie had stopped their individual strips and the characters were being rotated with Tansy of Jubilee Street in the “Old Friends” slot. Some of the Monster Tales were indeed so dark that they could be straight out of Misty herself. The cruellest of them all was arguably “Freak Tide” (above), where cruel owners of a Victorian freak show are abducted and taken to a sea-monster world. There they become the freaks in a cruel freak show, and unlike the freaks they once mistreated, they have no chance of escape. What’s more, they have nothing to wear but their nightshirts. 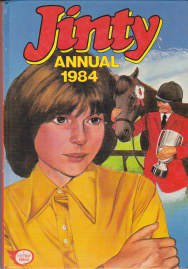 When the new-look Tammy was launched on 17 July 1982, Monster Tales stopped running. However, there were still monster-themed stories appearing for a while such as “Black Teddy” and “Bird of Fear”. I suspect these were unpublished scripts from Monster Tales being used up. These stories credited Roy Preston as the writer, so it is reasonable to assume Preston wrote a good deal of the Monster Tales too. Along with Dr Mel Gibson, David Roach, and a good-sized audience, on Saturday I took part in a lively and high-quality discussion about female creators of girls comics and many other related topics. It was organized as part of the Comix Creatrix exhibition of female comics artists; a great subject for an exhibition (particularly timely in the light of the kerfuffle at the Angouleme festival this year). 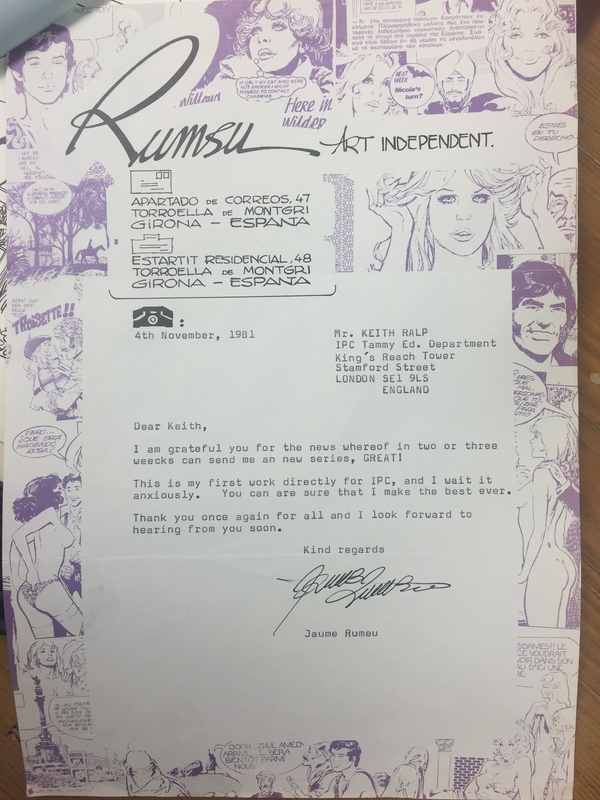 As tends to be the case, UK children’s comics didn’t get much of a look-in at the exhibition, though there is a page of Evelyn Flinders pencil art and an incomplete piece of Shirley Bellwood unpublished Misty art both on display. The exhibition is focused on mature readers on purpose – hence the ‘x’ in the word ‘comix’ – but the gap in the coverage of UK girls comics was pretty palpable following discussions on co-organizer Paul Gravett’s facebook page. And lo, it came to pass that some months later the three of us named above were convened at the House of Illustration, near King’s Cross. Paul Gravett introduced us all to kick off the proceedings, and Mel gave a more in-depth introduction of our various areas of specialities. Phoenix has described the event from his perspective, over on the Comics UK Forum, and there are some other posts on social media by attendees, with further description and photos. The talk was some two hours long (until shortly before it started I’d assumed it would be just 1 hour or so, but there was so much to talk about it never dragged!) and included time for questions as we went along, and afterwards too. I can’t at this point cover everything that we discussed, partly because I was obviously not in a position to take notes, and partly because of lack of time. I understand that the venue is supposed to have been recording the discussion, and assuming that is forthcoming I will update with details of how to listen to the recording. There are a couple of immediate points of ‘breaking news’ arising from the event, though – David Roach has dug out a set of samples by Emilia Prieto, who is clearly the artist on “Sceptre of the Toltecs” and “Kerry In The Clouds” – both art and signature match. It’s not very clear to me right now as to how the original misattribution could have happened, but the signatures of both artists are very similar, and of course there is always the question of whether a pseudonym was used at any point. I shall nevertheless be amending this blog’s references to specify “Emilia Prieto” instead. David also clarified some outstanding questions about the artist on “The Cult of the Cat”, credited on this blog as “H. Romeu” or “Honiera Romeu”. The artist’s pen name for many years was “Homero”, riffing off the Homer of antiquity (and ‘Honiera’ must therefore simply be a typo that crept in somewhere along the line). From the end of the 1970s or the beginning of the 1980s he reverted to his real surname (he was a Catalan, and in the Franco era it was forbidden to use Catalan surnames – people had to use the Castilian equivalent) for all purposes. So his real name, which I will change all the references on this blog to use, is “Jaume Rumeu”. However, as his penname during the relevant period was still Homero, I will include this as reference too. It may take a little time to apply this change consistently so do bear with me. One of the discussions points that I was particularly intrigued to hear was the fact that David catalogued some 40,000 pages of Amalgamated Press / Fleetway artwork, and had sight of the payment books from the relevant times – between the 1940s and 1960s I think he said. Between that and the fact that he has information originating from Barry Coker’s agency which dealt directly with many Spanish artists, David clearly has a huge amount of knowledge that is not only derived from long experience of analysing art, but also from actual records and archives. Watch this space for a future email interview with him, therefore! 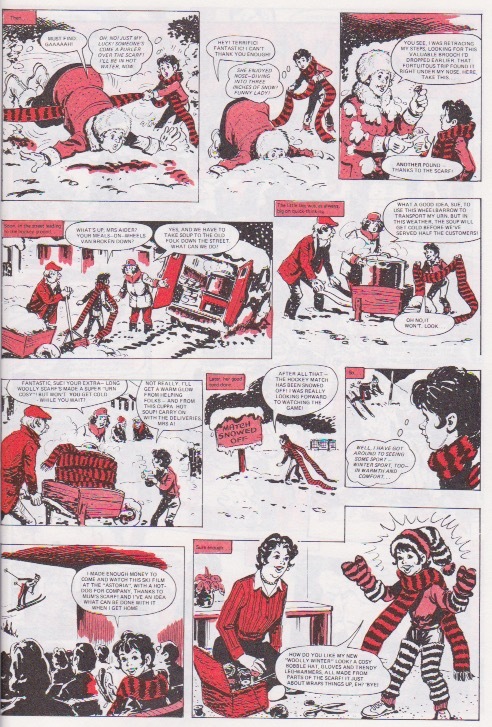 Jinty annual 1984 was the last Jinty annual to have any recognisable Jinty material. The next two would be a collection of reprints that were taken from older annuals and were Jinty in name only. Stories that are recognisably Jinty are Alley Cat, Snoopa, and reprints of The Four-Footed Friends and Forget-Me-Not at Christmas. But there is no trace anywhere of Gypsy Rose or Pam of Pond Hill. What appear to be new material are “The Talking Cat”, “Princess Punkerella” and the text stories. And the annual is heavy on features, such as recipes, art & craft, quizzes, general knowledge and games. We get some Misty in this annual. “The House Across the Way” is a surprise in that it is a reprint from Misty #16. “Princess Punkerella” could be straight out of Misty too, as it is drawn by Honiera Romeu, who was a regular Misty artist. The story is worthy of Misty too, as it concerns a punk girl, Ella Jones, who tries to extort money out of an old lady. The old lady says that her purse has nothing but three wishes. Ella uses the first two wishes to satisfy her greed, but as you might expect, it backfires and Ella’s third wish is to wish she had never met the old woman. Yet this story never appeared in Misty. Neither did “The Talking Cat”, which could be straight out of Misty as well. Shona finds her beloved cat Clovis, who has been taken ill, can suddenly talk. The reason is that he is possessed by an alien, and it’s not long before all the cats in the neighbourhood are talking too! It all turns out to be a dream, but of course Clovis recovers. 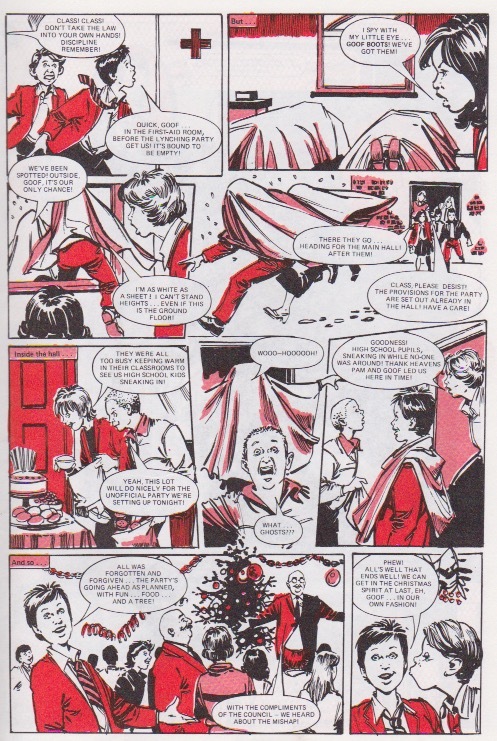 While this can be described as the last substantial Jinty annual, it is a bit disappointing that it does not use more Jinty material, even just more reprints. Some of the shorter Jinty stories, such as Tale of the Panto Cat, could have been recycled, and likewise with Gypsy Rose tales. 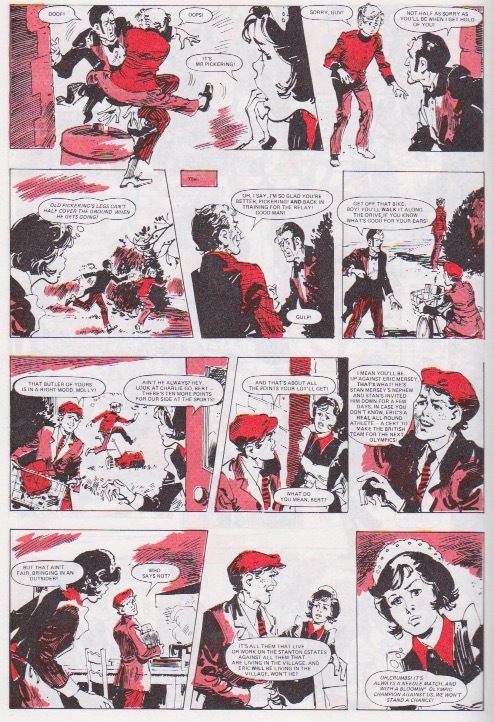 Why did Jinty not use more of her own material – legal reasons, maybe? Or economics? Still, this annual would still satisfy any reader who wants a good read from cover to cover.